The Flight Module approach was re­vived by two Cali­fornians, Henry Smolinski and Harold Blake, founded Advanced Vehicle Engineers Inc in 1971 to design and build a flying car. 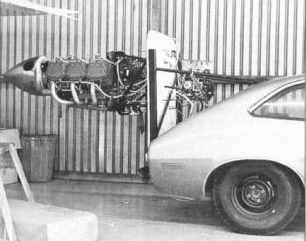 AVE combined a standard US production automobile, a Ford Pinto, with the wings, tail and rear engine of Cessna's push‑pull Skymaster aircraft as the Mizar. 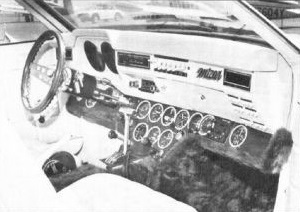 The Pinto was exten­sively modified, so that its steering wheel not only steered on the ground, but operated the ailerons and elevators. A pair of retractable rudder pedals fitted beneath the fur‑trimmed dash­board, which had a full panel of flight in­struments and avionics alongside the usual Detroit fittings. Self‑locking high‑strength steel pins and tracking attached the flying surfaces to the car. Buyers were to be offered a choice of three modules with 235‑, 260- or 300‑hp engines, ranging in price from $12,319 to $22,974, Plus $5974 for the Pinto, whitewall tires included. And if you were not a Ford fan, you could have a modi­fied Chevrolet or Pontiac. AVE's Mizar was surely the easiest air­craft ever to manoeuvre on the ground: you just shifted the automatic transmission to 'Drive' and away you went. For take‑off, the road drive and propeller could be used together for a swift departure, or so went the theory. In practice the Mizar per­formed miserably with a 210‑hp engine. The powerplant failed on its first flight and Smolinski and Blake had to drive back to their airfield. Towards the end of 1973 car and aircraft went their separate ways just after take‑off, killing the two inventors and their project.